Take your creativity to the next level either in the studio or on stage with Pioneer DJ’s TORAIZ SP-16 sampler and step sequencer. The tactile sampler features an intuitive layout, touch screen, 16 powerful sampler engines, analogue filters based on Dave Smith Instruments’ Prophet-6 synthesiser, quantize capabilities via Pro DJ Link, and more. Pioneer DJ recently dropped some exciting news with the announcement of their first major piece of production gear for DJs and producers, the TORAIZ SP-16 sampler and step sequencer. In collaboration with legendary synth creator Dave Smith, the TORAIZ SP-16 is a tactile hardware sampler that features an intuitive layout, 7-inch touchscreen, 16 powerful sampler engines, analogue filters based on the Prophet-6 synthesiser, and Pro DJ Link to combine Pioneer DJ’s CDJ or XDJ DJ Deck for perfectly timed one-shots and loops. In addition, TORAIZ SP-16 can be used as a standalone unit for live performances without needing a laptop. In this video, Dave Smith talks about the development of the project, collaboration with Pioneer DJ, why the synchronisation with CDJ’s makes this sampler one of a kind, the future of DJing and live performance, and more. Touch Screen: The 7-inch full-color touch screen displays detailed sample information and controls dials to quickly browse and load samples, allocate colors to them for a visual guide, and manipulate a variety of other parameters. The display also shows real-time waveforms and full details of the sample’s characteristics. 16-Step Sequencer: Create up to 256 patterns by dropping sounds into the sequencer to create your own 16-step loops and then use the six dials to modulate the sounds. Also, the multi-colored buttons reflect the colors that have been assigned to each sound. You can also save patterns and play them back instantly. 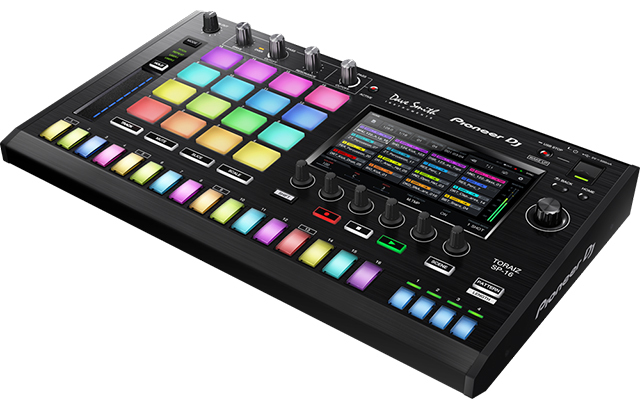 Multicolor Performance Pads with Velocity: The Performance Pads are taken from Pioneer DJ controllers to give you a truly tactile experience. Load up to 16 samples to the pads, then finger drum freely to layer sounds on-the-fly. The lights reflect the colors assigned to each sound, while Velocity Mode lets you control the volume of the sample with how hard you hit the pad. Analogue Filters from Dave Smith Instruments: Pioneer DJ has collaborated with Dave Smith to add the analogue filters from his iconic Prophet-6 synthesiser, adding true analogue warmth and presence to the TORAIZ SP-16. Pro DJ Link and MIDI Clock: TORAIZ SP-16 can be combined with Pioneer DJ’s CDJ or XDJ decks using Pro DJ Link to automatically sync the sampler’s one-shots and loops to the beat of the master deck. Easily layer multiple sounds over your tracks and know they will always be in sync. This unit also has a MIDI clock so you can sync other devices via USB. 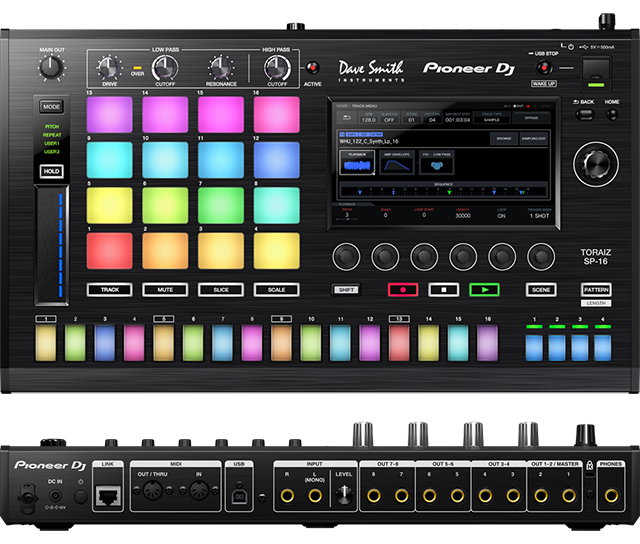 Pioneer DJ will also be adding connectivity with DAWs and synths at a later date. Flash Memory and Real-time Processing: The TORAIZ SP-16 delivers 16-voice polyphony so you can play all 16 samples simultaneously, even when editing the sound or using time stretch. The real-time processing engine means you can reliably manipulate the sound using time stretch, pitch bend, and amp envelope. The included 8GB of flash memory gives you plenty of space and means you can use the unit as a standalone sampler without the need for a laptop. Additional Features: TORAIZ SP-16 is equipped with a touch strip to control various parameters including pitch bending and comes bundled with 2GB of Loopmasters samples already on board.